A group of investors plan to make an offer for the Mexican airline. The group said Wednesday it plans to launch a public tender offer for between 50 percent and 100 percent of Aeromexico for 1.68 pesos (US$0.15; 0.11 EUR) a share, or about US$151 million (108 million EUR), the Citigroup unit, Banamex, said in a news release Wednesday. Aeromexico is owned by Consorcio Aeromexico SA. Aeromexico's shares were trading up nearly 11 percent at 1.76 pesos at midday on Mexico City's stock exchange, apparently reflecting investors' expectations of a sweetened bid. The new bid is significantly higher than that offered by the Mexican father-son investment team of Alberto Saba Raffoul and Moises Saba Masri, who offered 1.10 pesos (10 cents) a share, or about US$98 million (70.5 million EUR), for the carrier. Banamex said the group has requested authorization from the Federal Competition Commission and the National Banking and Securities Commission. The Federal Competition Commission recently approved the Sabas' offer, as did Aeromexico's board. Mexico's other major carrier, Mexicana, and Aeromexico were part of government-owned holding company Cintra SA, which put the two carriers up for sale in 2005. The Federal Competition Commission wants to generate competition in the domestic airline market. The government sold Mexicana to hotel group Grupo Posadas SA, but rejected bids for Aeromexico as too low. The government currently owns 62 percent of Aeromexico. 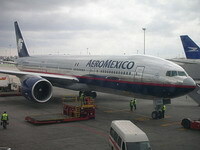 On Tuesday, the antitrust agency announced that Posadas planned to bid for Aeromexico. Grupo Posadas says it has taken no steps to buy the airline. The 14 private bidders include members of the Aramburuzabala family, which controls the country's top brewer, Grupo Modelo SAB, and the Canales Clariond family, which recently sold steel maker Grupo Imsa.